If, like me, you're totally useless at constructing flat pack furniture, then you may wince at the thought of this Beat Bot self assembly robot speaker. But rest assured, this is flat pack without too much hassle. 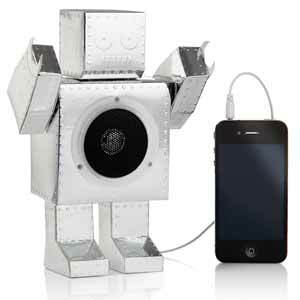 The kit comes with everything you need (apart from glue) to get your own robot speaker system up and running. It's has a simple cardboard design with a metallic, foil side to give it a metal appearance. 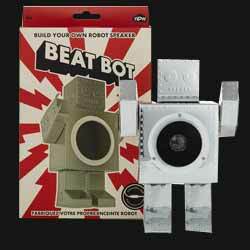 And, to be honest, you don't even have to construct this as a robot. You can easily just make the box with the speaker housed in it, and then construct something yourself out of any material you have lying around (like they used to do on Blue Peter). When fully assembled, the robot measures 196mm (H) x 128mm (W) x 63mm (D). For younger members of the family, this will make an interesting present, especially as it allows them to construct something of use. And while the sound is not overly great, for the £10 RRP, you really can't grumble.